The seventh season of the fantasy drama television series Game of Thrones was ordered by HBO on April 21, 2016, just three days before the premiere of the show's sixth season. Like the previous season, it will largely consist of original content currently not found in George R. R. Martin's A Song of Ice and Fire series, but also adapts material from the upcoming sixth and seventh novels The Winds of Winter and A Dream of Spring.The season will premiere later than usual, in mid-2017. 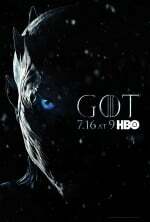 Unlike previous seasons that all consisted of ten episodes, the seventh season will consist of seven episodes.